This may sound like a good idea, since there is no any cost. However, there are obvious disadvantages there, such as high difficulty and demand for technique, etc. Please refer to How to downgrade UHD friendly drive firmware to learn about how to use free tools to downgrade firmware. If you haven’t worked in IT field, the solution is hard for you to implement for you. The most critical thing is that you will have to find an obsolete desktop computer with supporting IDE mode. You have to take the failure risk by yourself. Once the firmware downgrading is processed improperly, your UHD drive will be thrown into the trash. Nowadays, some paid firmware downgrade tools such as Firmware Flash Tool, UHD Drive Tool, UHD Suite ,etc have been released. It is not recommended to pay for such applications. Because they are very expensive, and essentially use the same technology as free software tools. The paid tools also require an obsolete desktop computer with supporting IDE mode. The failure risk is still on your own. Once the firmware downgrading is failure, you will lose both money and the new drive. Those software tools’ developers won’t pay one cent for your losses. The third solution is to go for a Plug and Play UHD friendly drive. 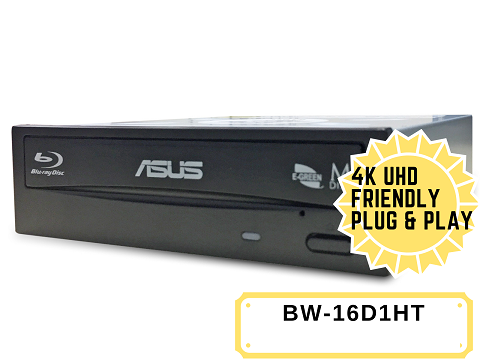 All your need to do is purchase a Plug and Play UHD friendly drive. The drive is a bit more expensive than an new Blu-ray drive. There are reasons to pay the money for it: No software is required, there is no need to take any risks, free shipping and professional technical support. First, downgrading drive firmware using a free tool involves complex operations and professional computer knowledge, so you must be a tech savvy. If operated improperly, it may result in downgrade failure, or even damage the optical drive and void the warranty. In addition, you need to switch AHCI to IDE mode in the BIOS settings of computer system. However, for the latest computer system, you may not be able to find an option to set the IDE mode any more. The only way out is to try to find an obsolete computer system. This process is very time consuming. Paid UHD drive tools are very expensive (more than $200). The tools use the techniques as similar as free software tools. Downgraded drives are poor compatibility with UHD backup software tools, so paid UHD drive tools are not recommended at all. In contrast, buying a ready Plug and Play UHD friendly drive is the best option. It can be achieved with a reasonable price, no need for much technical knowledge and support all UHD backup tools. Meanwhile, you can get professional technical support from the sellers anytime. Why not? Tip: How to switch to your local country for purchase the drives.